Vjoon looked at the layout which MEI forwarded to them. Their observations were the American as mine and they have passed the layout to Adobe. Vkoon confirms that there are no Prepress plug-ins for InCopy CS6 and that InCopy must handle this missing plug-in in a special way so as to not disturb the user. For some reason our layouts end up disturbing the InCopy user. 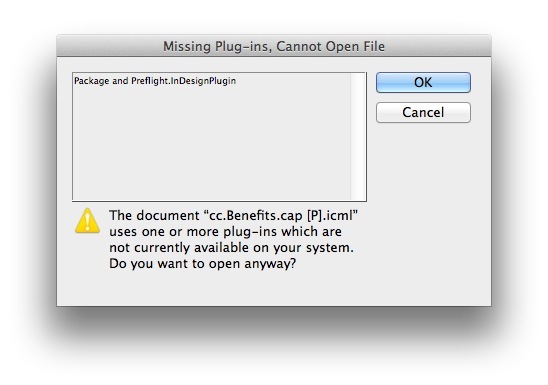 While using official releases of ID and IC updates fixes the Extensions Manager issues, it still leaves open the question why InCopy CS6 is having this missing Plug-Ins issue. I looked back at InCopy CS5 and opened an article from the previous issue and examined associated plug-ins and no problem. I examined the plug-ins associated with articles attached to layouts in InCopy CS5 and the Package and Preflight plug-in is listed, but InCopy CS5 is handling it fine. I compared InCopy CS5 and CS6 plug-ins. CS5 has the Prepress Plug-ins folder, CS6 doesn't. For some reason our InCopy CS6 Installer isn't installing these plug-ins. Today we moved everyone from CS5 products to CS6. Surprisingly nothing went wrong. I switched people over today and they kept working like it was yesterday. We used Adobe Application Manager to create pkg files with updates, so we were able to push installation and the .406 update via Apple Remote Desktop. We mound AAM 3.1 very easy to use. Install InCopy CS6 rapid release updater. Push the vjoon K4 plugins folder to the Macs. Run Adobe Updates to update all Adobe software except for InCopy CS6. Pushed a folder with the name of the hard disk into the InCopy application. All of our Macs hard disks share the same names. This folder is located in Adobe InCopy CS6.app. You need to open the package (right or command click on the app and select Show Package Contents from the popup menu), then open the Contents folder then open the MacOS folder and create the new folder here. I pushed this folder from my iMac to all of the Macs running InCopy CS6. When the user was in the office I pushed my InCopy preferences to their accounts. This provides a common starting point. I let users know that we could copy their InCopy CS5 preferences into CS6 if they preferred. Made sure that they had the Universal Type Client plugin by either installing a new version of UTC on the Mac or pushing the UTC plugin from my Mac. So I prepped the Macs earlier this week, did final installations this morning, and let staff to let me know when they logged into their Macs. I removed InCopy CS5 from their Dock and put in CS6 and tested each workstation. I checked with staff later in the day and they confirmed that everything was working fine. Fortunately for InCopy users CS5 and CS6 work in an almost identical manner. InDesign users were updated in an almost identical manner. Today I tried updating our K4 Server from version 6.4r3-2 to 6.4r4-3. This should have been a simple server update. Patrick at MEI sent me wonderful instructions and we reviewed what needed to be done. The only reason for the update is to support InDesign and InCopy CS6. Big fail. Everything looked OK until I signed in as the schema administrator. I could not see the Schema or Users and when I look at the admin profile it showed that I had no ability to do anything. We had 2 admin accounts and both had the same problem. So I called MEI and Patrick helped me. He created a new k4base database. Still had problems. He checked my logs and saw that I was running an old version of Tomcat. Updated that. Didn't help. He couldn't believe that we had these problems and I took screen shots and he wrote up nots and they have all been sent to vjoon. Fortunately the problem we were having prevented any of the publicatioin schemas from being updated, so when I restored the backed up K4 folder, you do remember to backup everything before trying a critical upgrade, everything just worked. It is frustrating and I cannot attempt another update for at least 2 weeks. Let's see how well that fits in with the installation of our new phone system. On a positive note I learned more about K4 internals. Of note, the K4 database holds your publication information. The K4base database only holds information about schema administrators. So if the K4base is messed up it is easy to create another K4base and your K4 database isn't trashed. One new tool in K4 6.4x is Collections.​ I had some time to play with it today and a couple of people in the editorial department will test it out. It turns out that there is a workflow column after all. To see it you just have to expand the size of the Type column. Here is the default Type column. Tonight I will upgrade my home iMac to Mountain Lion and see how well InDesign and InCopy CS5 and K4 behave themselves.